This entry was posted on September 30, 2010 at 8:15 am and is filed under Afghanistan, Armegeddon, Barack Obama, Congress, Conservative Issues, defense, Democrats, Economy, George Bush, Harry Reid, Iran, Iraq, Media, military, Politics, proliferation, terrorism, War. You can follow any responses to this entry through the RSS 2.0 feed. You can skip to the end and leave a response. Pinging is currently not allowed. You are absolutely correct in your assessment of the democrats behavior. They are appallingly traitorous and political at every turn. I distinctly remember them standing on the steps of the congress after 911 and wondering allowed how long it would be before they turned on Bush and start using the war as a way to gain back their political power. It is the same wonderment I had at all the fair weather patriots who adorned their cars with flags, as to how long they would maintain their fervor knowing hard times were yet to come. Many people it seems are child like in terms of understanding the hard truths of reality versus the wishful world they want to exist. As to Iran, the question is will Israel act before they actually have the capability of deploying nuclear weapondry. I think they will do something and then face the condemnation of the marxist and weak minded obaminites. You used a picture from one of my favorite movies. 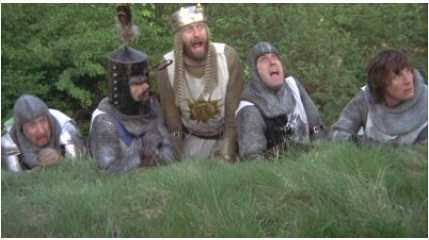 Does not the Knight who Guards the bridge and won’t let King Arthur pass reminds you of the democrats as he denies being injured even as he loses all his limbs. Facts always present them problems to deny. I am often astounded at the absurd things that are getting news coverage in relation to the real dangers of a nuclear Iran and the dismantling and destruction of America Obama is executing. I have been reading ‘The Post-American President’ by Pamela Geller with Robert Spencer. Their pain staking documentation of what this man has done to make America and the world unsafe is staggering. Obama is a wicked man and so are his intentions, agenda and policies. I am also very dis-heartened at my fellow Americans who deny reality and live in a fantasy. Former Democrat strategist Pat Caddell (“former” because the Democrats who allow so much diversity kicked him out when he criticized their sheer stupidity of the last two years) said that the Democrats have gone beyond myopia – they have become a cult. And he referenced the basis of their cult as a massive superiority complex (“We’re so smart and you’re so stupid”). He (and I) would certainly see the “It’s just a flesh wound!” mindset of the Democrats. In order for Israel to strike, they need an airspace corridor. And either the US (Barack Obama) or a Muslim country (Saudi Arabia or Turkey) will have to grant it. If Israel flies through US-controlled airspace, it will be assumed that the US let them fly through. I don’t think Obama would be able to sleep nights thinking he helped allow Israel to save itself from evil. Second, Israel simply doesn’t have the means to do enough damage in a single raid. They learned from Iraq’s nuclear program that Israel destroyed; they hardened and spread out their nuclear facilities. A lot of experts just don’t think Israel can do enough damage. Which puts all the onus on Obama to prevent what will surely lead to WWIII. Only he’s the weakest, most incompetent, most anti-Israel and pro-Islamic, and most ideologically-radical, administration in history. There was a time in American history in which both Democrats and Republicans saw the world and the threats to the world in largely similar ways. Both parties believed in God, and both believed in having a strong defense and facing our enemies. Their disagreements were largely over economic policies and money. Those days are gone. Now today’s Democrat party is fundamentally opposed to everything JFK stood for. And they have become fundamentally perverted and depraved. I’ve said this many times: my “moment” was the Jeremiah Wright tapes, in which Obama’s “reverend” and “spiritual leader” said things that were depraved beyond belief again and again and again. I knew then that Barack Obama was genuinely evil. I didn’t know a great deal about politics, and had never been politically active (beyond faithfully voting); but I knew that Barack Obama had steeped himself and his family in a truly evil and fundamentally anti-christ church for 23 years. That was my moment. And I saw with such clarity what the world would be like under Obama that it has vividly stuck with me to this day. And the most amazing thing of all is that – as awful as I thought an Obama presidency would be – it has actually been even WORSE. But as bad as Obama has been for America, Democrats today lack the psychological, moral and spiritual resources to comprehend it. And, of course, by the time that the crimes against America that Obama have committed become so manifest that even Democrats can understand it, Democrats will have found a scapegoat to blame the disaster on. I agree Michael, it has been worse living under Obama then what those of us who ‘saw’ what was coming thought. The anti-America ‘Left’/Democrats are despicable and I wish we could try every last one of them for crimes against the Republic and the producing/tax-payers that make this country work. I’m grateful I found you in the Spring of 2008, you continue to document the truth and give insightful commentary, Michael. May our Lord bless you for this good work you continue to do. At a certain point when it becomes obvious to Israel that obama will not support their survival in a meaningful way I do not believe they will sit back an allow their demise based on the technicality of not having permission to fly through someones air space. Nor will they be detered by whether or not they may have to do a prolonged series of raids to accomplish their objective. Theoretically and historically they have superior air abilities and their warriors are better motivated to succeed or die. Men fighting for dictators seldom match the tenacity of men fighting for their homelands very survival. Once Iran is engaged, obama will face a decision as to whether or not to support Israel or let them be destroyed. Of course this leftist ideologue would, if left to his own devices, probably choose to follow his democratic base over fighting with our historic allie against a common enemy, but again he would be flying in the face of public opinion, which he has shown to be comfortable in doing, but that could further lead to his undoing. The bottom line is that Israel will not wait for permission to defend themselves if they feel it is the last option availible. Thanks, HL. The support and encouragement you’ve given me has meant a lot. – has been brought up before. David asked, “Why do the wicked prosper?” Read Psalm 37. This world is unfair because it has been contaminated by sin. God says, “Trust Me. In the end, I will repay faith and good with great eternal reward; and I will repay unbelief and evil with the fires of hell. These people will get theirs. They can laugh and yuck it up now, and it will seem like the evil get off scott free. But God is keeping accounts, and one day they will pay. People like to think of Jesus like Barney the Dinosaur. But when He returns as King of King and Lord of Lords, He will deal in blood with those who rejected His salvation and His kingdom. The One who came to save those who would believe Him and accept His ways from hell talked more about hell than ANYONE. Look in a concordance and see how many times Jesus spoke of hell – you’d be amazed. So you just keep the faith, HL. Because the scales of justice will be balanced. And we won’t have to lift a finger! I hope you’re right on all counts. One thing that will make it FAR more difficult for Obama to leave Israel twisting in the wind would be a Republican majority in the House and the Senate. For Israel’s sake – and for ours – let us pray for victory in November!